True Mediterranean spirit, the combination of past and present on a living land and live sea, places full of secrets, battles, wars, bloody marches, conquests and sunken worlds. Split, a magnificent city - palace of a Roman emperor Diocletian and treasury of unique monuments, stone statues and white denuded houses, squares and temples; Trogir, a Greek city with colonists’ fortress, today the uniquely preserved town, castle and towers; Solin, ancient city of Salona - once the capital of the Roman province of Dalmatia, today full of tangible and widespread stone buildings, sites, ruins, atriums and palace arches. Region full of natural heritage, from the island of Vis to karstic Dalmatinska Zagora, shipwrecks and dark caves to the grandiose fortresses that have been creating the culture. Land that still remembers its first people now appreciates and evaluates written and unwritten culture, tangible and ancient history, monuments and ruins. 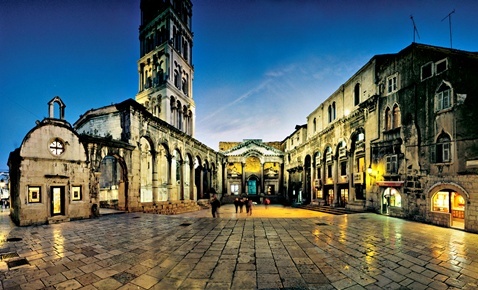 One of the most astonishing buildings by the sea is Diocletian's Palace, the last habitat of a strong and mighty Roman Emperor, situated at the foot of mountains Mosor and Kozjak. Today, the palace is one of few well preserved ancient monuments where life has been developing from 1700 till today.